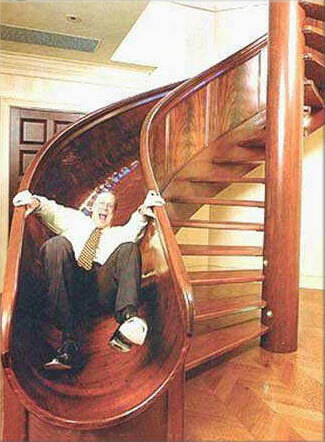 Cool spiral stair case made by Rod Miller who lives in Anderson, Indiana. This entry was posted in Web links on May 31, 2004 by Links. I was greeted at my door step with this sight today. 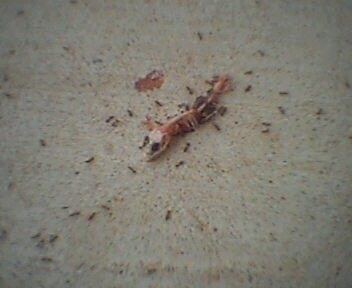 It looks like a lizard or a snake (I didn’t get too close) died and the ants were hungry. Usually, all the ants dine on are earth-worms. They must be picky eaters because they never finish the worms off like they are doing to this poor creature. I wish the ants would devour those earth-worms instead of leaving the shriveled up, mummified carcasses on my driveway. Ants are close to the top of the insect food chain. They are up there with spiders and wasps. But they have no defense against a broom! This entry was posted in Phone post on May 30, 2004 by Mark. 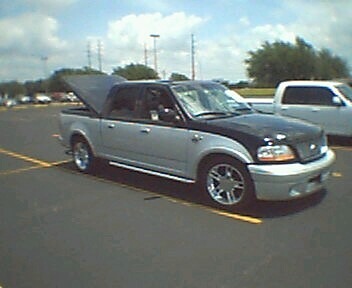 This entry was posted in Web links on May 24, 2004 by Links. And so it begins… temperatures in the high 80s (with a 90 degree day on Wednesday)… the air conditioner starts to turn on… the green landscape starts to turn a thousand shades of yellow… 4 1/2 months of oven-like heat! And, no, that is not a U.F.O. 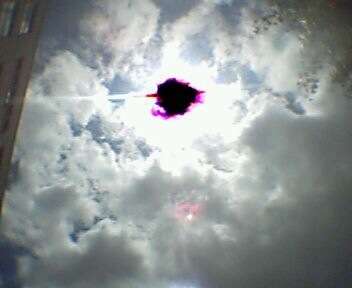 That is is sun. Which for some reason turned the camera’s recptors black. This entry was posted in Phone post on May 17, 2004 by Mark. 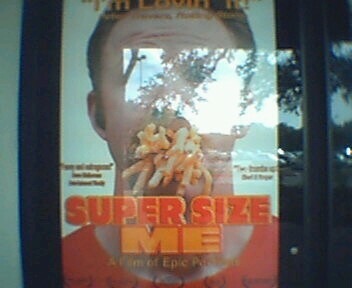 I went to see Supersize me today. I was interesting to see the effect of eating Mc Donnald’s food for 31 days straight. At the start, doctors thought that no harm would come to the director, Morgan Spurlock. However Morgan’s liver was in bad shape after two weeks! Doctors were recommending that he quit eating Mc Donnalds. The scariest part of the movie was the statement that children are brought up to remember Mc Donnalds fondly when they eat and play in the restaurant. This reinforces the eating at fast food restaurants behavior of adults. Kids are able to recognize Mc Donnalds before they can read. Also, their eating habbits at schools was not that encouraging. This entry was posted in Phone post on May 15, 2004 by Mark. This entry was posted in Web links on May 10, 2004 by Links. 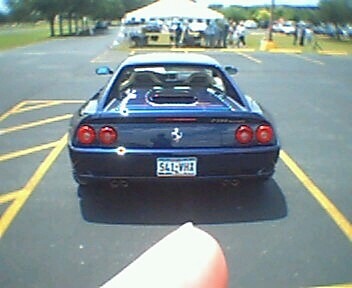 IBM had an auto show for IBM employees/retirees today in a parking lot. 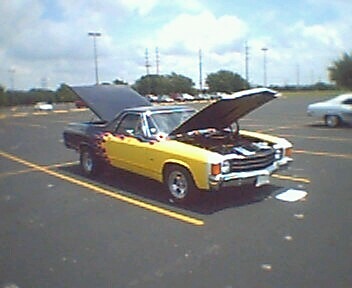 There was a small selection of cars to look at. I wonder how many employers do this for their employees? This entry was posted in Phone post on May 7, 2004 by Mark. This entry was posted in Web links on May 3, 2004 by Links. 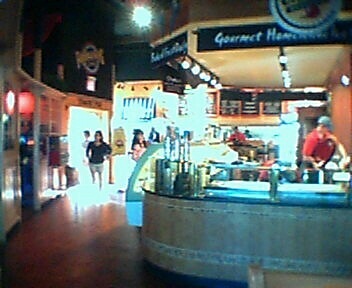 Fuddruckers is another example of a company enabling people to eat too much food. But first let me preface this commentary by saying that, so far, it is the only good hamburger place that I have found where they will cook the burgers medium-rare for you. However, the problems can outweigh the benefits. First, they sell burgers up to one pound in size. Then they use a large, buttered bun. Then you may order extra toppings for the hamburger. Next, you may order some sides such as french fries or onion rings. Of course, you need a soda to go with that. Then, place free toppings (lettuce, tomatoes, onions, salsa, mayonnaise). Don’t forget the cheese sauce for your fries! And if that was not enough, there is a dessert area where you can order milk shakes, cookies, brownies, pies, or ice cream. Of course, they make it convenient by creating meal specials (hamburger, fries, dessert) to further incent you. If only people could show more restraint in eating. Don’t forget that this is a costly experience. Is 10 to 15 dollars too much to pay for a 2000 calorie meal? This entry was posted in Phone post on May 2, 2004 by Mark.